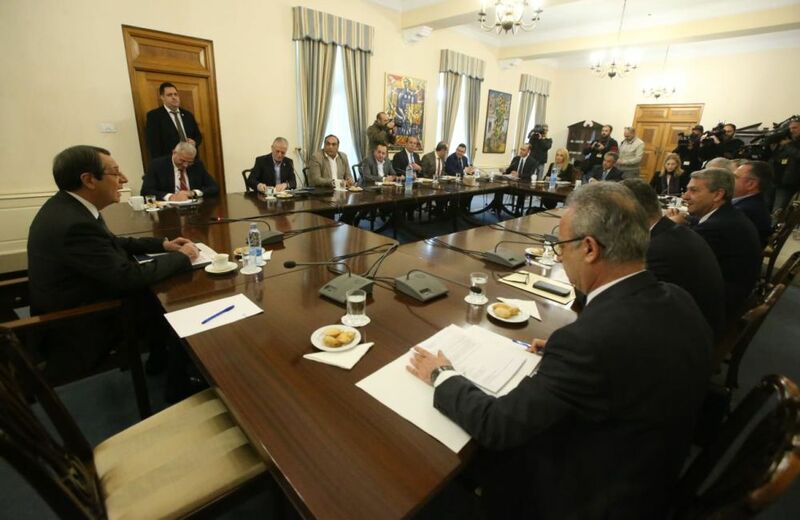 During the wide-ranging meeting at the Cyprus Presidential Palace and in the presence of the President of the Republic Nicos Anastasiades, the Attorney-General Costas Clerides and the leaders of the political parties, the next steps were decided on the decision of the administrative court that was positive about the retrospective return of an amount of 1.2 billion euros to civil servants in Cyprus. The purpose of the meeting was to decide the next steps and make it clear to the Attorney-General of the Republic that the government can appeal against the decision. It is worth recalling, in this context, the background to the above decision, which, as we have written, is as follows: On 29 March, the three-member Administrative Court ruled unanimously as unconstitutional the Law of 2012 concerning the wages and pensions reduction of Officials, Servants and Pensioners of the State Service and Broader Public Sector. Moreover, the majority ruled also as unconstitutional the Law on Retirement Benefits for State Officials and Servants of the Broader Public Sector (cut on the portion of their gross earnings as a contribution to the Consolidated Fund of the Republic) and the Law of 2011 concerning the Non-Granting of Increases and Indexed increases on Officials and Employees’ Wages and on Pensions of the State Service and the Broader Public Sector. The Wages Reduction Law was passed in December 2012 and came into force immediately. The same law also froze the surcharges for a period of two years. As a result, the measures imposed in 2012 to freeze increases in wages and 3% in the pension’s draft law are unconstitutional. Based on our information, the Cypriot government seems to have taken the green light from the Attorney General of the Republic to proceed with an appeal against the previous decision. During the meeting, a review was made concerning what had been preceded, the case law taken into account for the decision taken and the main points. The appeal is justified on two main grounds, as the Attorney General has said. “Firstly, because this is a very serious issue of public interest, which certainly affects to a great extent the finances of the state, and second, because such matters should be finally judged by the highest judicial body of the country”. On the same axis, a decision was taken to request suspension of the decision for obviously reasons, which also fall in the public interest. “We have also explained our positions as to which the reasons for appeals will be and to the extent that it can be predicted, what are the chances of success”, said Costas Clerides. As to the latter issue, the chances of success, legal circles pointed out that the Attorney-General would not even proceed with the appeals if there wasn’t a certain percentage of expected success. These is word for a number of appeals and not of one appeal, so since the decisions of the administrative court are three, all three will be appealed, with only one of them concerning the amounts that the Cypriot government has to give retrospectively. One of the other things that was relevant to this case was the possible amendment of the Constitution of Cyprus as a defense measure.